Capture website visitors with personalised overlays and push straight into your sales pipeline. It’s no secret that personalisation in marketing is more important than ever. As consumers, we’re more swamped in channels and content than ever. You don’t want your website visitors to feel like numbers. Landing pages are where they opt-in for your value or bounce off in forgetfulness, gone for eternity. You only get one chance at making a first impression and personalisation is your golden ticket to getting that right. 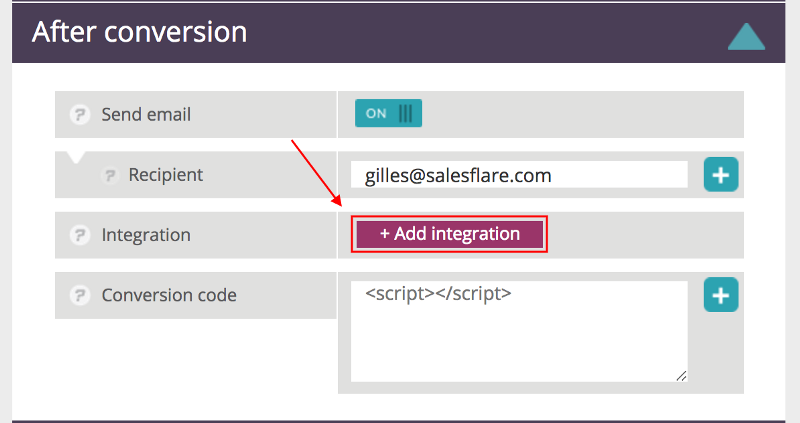 That is exactly what Poptin is all about, Salesflare’s newest native integration. Popt-in enables you to have your landing page dress up for your visitors with pop-ups, overlays, sidebars, loading bars, embedded forms, social share buttons and more. Whatever works to increase conversation likeliness. This stuff won’t just randomly show. You’ll get extensive targeting power based on stuff like traffic source, dates and time of the day, specific web pages, new or returning visitors, web or mobile, browser, frequency… The list goes on. You can have Poptin show its many faces based on behaviour of your website visitors. Think a special deal popping up when they plan to leave or after they’ve spent a certain amount of time on your website. The right message at the right time, all in just a few clicks. With more of those visitors converting into leads, you’re going to need your buddy Salesflare more than ever. When creating an overlay with input in Poptin, simply select Salesflare as an integration to automatically have lead data pushed in your sales pipeline. You’ll get to do this in Step 2. To start having your visitors (p)opting-in, head to Poptin.com and start a free account.